As Modern Mormon Men, we have the opportunity to take part in General Conference two times a year. Every Spring, when the air gets warmer and the tulips start to burst through the hard Utah soil, you know that General Conference is coming soon. Thousands of people flock to Salt Lake City to attend the sessions, visit family, friends and go to missions reunions all over the Wasatch Front. It is a time of year to do some 'spring cleaning' in your own personal life. It is a time to reflect on your life, your family members' lives and to make appropriate changes to become a better person and a better member of the church. It is a great weekend where you can just sit at home in your pajamas, eat good food, lounge around the house and watch conference on your tv, computer, radio, iPad or iPhone. (Isn't technology awesome!) It's a nice break from the typical Sunday routine, plus my wife makes awesome cinnamon rolls! There are five sessions that take place over a two-day period. On Saturday night, men leave their wives, women and children at home to go to a Priesthood session. This meeting was by far my favorite this year. It seemed like the majority of the talks were directed to men being men, to taking responsibility, to taking charge of our households and stepping up to our Priesthood responsibilities. As Mormon Modern Men, we need to be willing and worthy of the Priesthood authority that we hold. We should be different men because of the Priesthood. Each talk given was great motivation to step up a be a better man, husband and father. 1. Gain and keep a sure witness that the Priesthood keys are with us. Pray for that everyday. 2. Love your wife. It will take faith and humility to put her interests above your own struggles of life. 3. Enlist the entire family to love each other. 4. Lead your family in the Lord's way when discipline is needed. We can meet our obligation to correct in the Lord's way and to lead them toward eternal life. This list is awesome! It is powerful and is a great reminder to us men. We as men, as modern mormon men, need to step up and take charge of our families. We can't be ashamed or embarrassed to tell our family members that we love them. We need to take on responsibility and be a leader in our families, to set a good example and show what love really is. The last point of his talk is great. 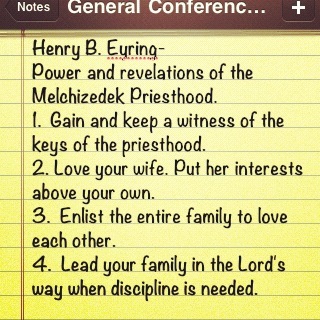 Elder Eyring talked about being able to discipline within your family when it is needed. Of course there are going to be difficult times and trials and it is important to be able to take control of the situation and this may require you to discipline your children as needed. Since we are now being men, we can decide with our wives what the best method is and how it should be used. So who's with me? Will you be the man that you are and ought to be? It's not too late to make changes and to step up and be the men that we know we are! What talks were your favorites? Which talks caused you to reflect on your life and start with some 'spring cleaning' of your own? Please share in the comments section.